I found these rare chunks of magnetic rainbow hematite and fell head-over-heels in love. I knew you would love them too. These are special additions to your collection. Hematite’s healing properties (grounding, connecting, healing the root chakra) are expanded in this titanium-treated form which lends the properties of titanium as well (it’s a healing metal that is associated with crown chakra activation). I use magnetic rainbow hematite to CONNECT my root and crown chakras, bringing my full body into alignment. This stone has quickly become one of my favorites because it’s stunningly beautiful and functional, too. Hold yours in meditation and feel its grounding power. You may want to buy two, so you can experience the magic of the natural magnetic power each stone has. 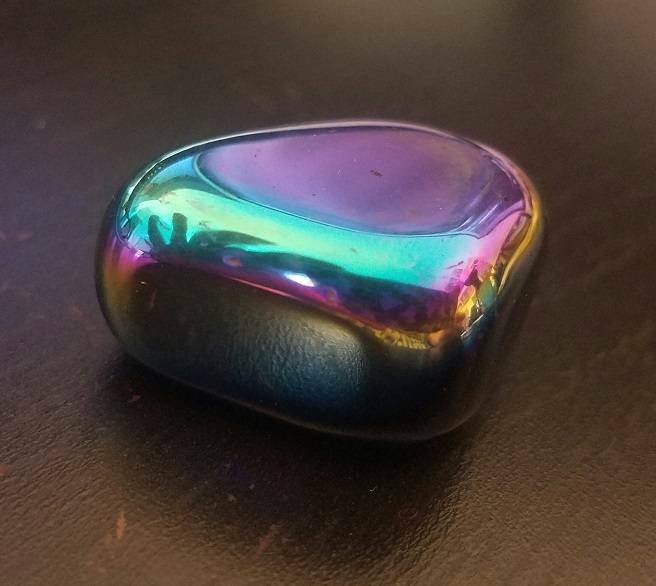 This listing is for (1) tumbled piece of magnetic rainbow hematite, which will come gift-bagged in organza with a white sage leaf that you can use to clear energies before using. You also receive a card describing the properties and recommended use of each stone in case you are offering it to another who has not worked with this stone before. Each piece is chosen carefully and vetted for quality. Shop with confidence.